There’s still time to go jump in a mountain lake near Asheville, where water temperatures are still in the mid 70s to low 60s and are expected to remain close to these levels for the next month or so. 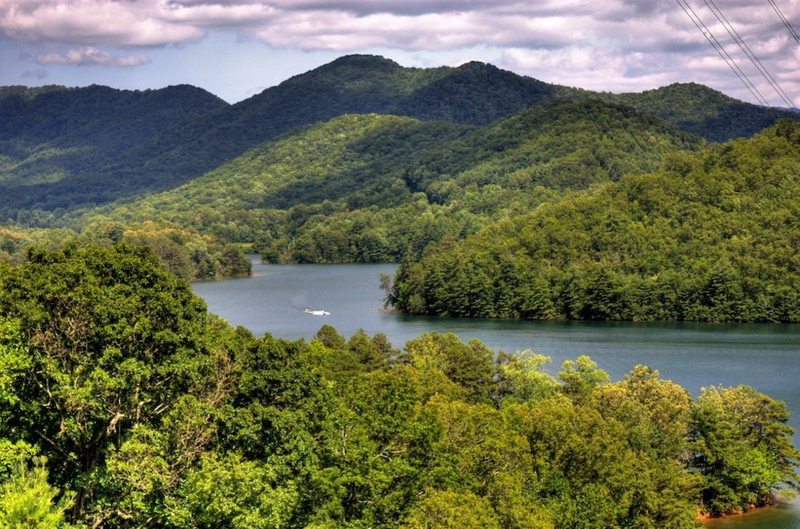 That’s great news for swimmers, standup paddlers, and anyone who has so far missed out on one of Western Carolina's best summer assets: its mountain lakes. RootsRated suggests a few that are perfect getaways for the remaining summer weekends. 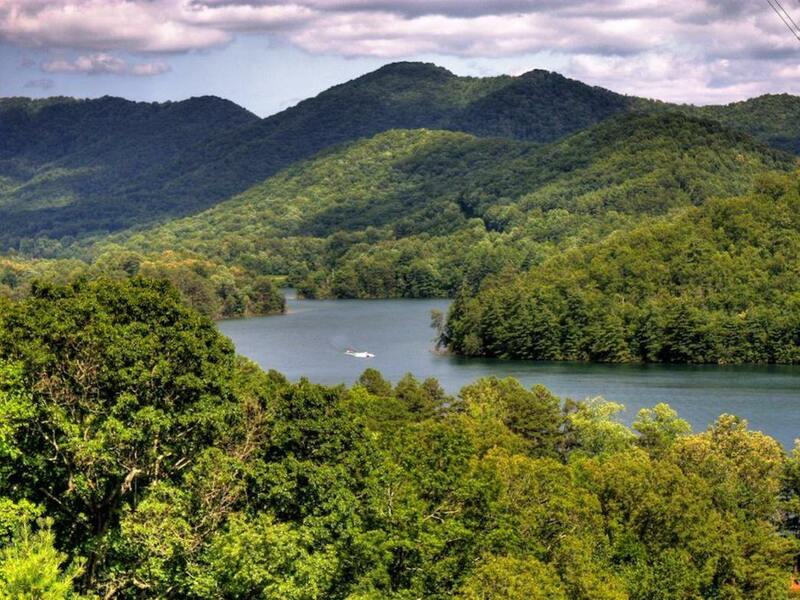 Located about two hours from Asheville (close to the town of Robbinsville), Lake Santeelah was created in 1928 with the damming of the Cheoah River and it remains mostly surrounded by the Nantahala National Forest . While part of the lake (which encompasses 128 acres) is developed with private homes, much of it is undeveloped, with the exception of a few swimming and picnic areas and a small scenic campground on the water at Cheoah Point . Santeelah Marina issues fishing licenses and offers kayak, canoe and pontoon rentals. The Santeelah Lake Trail is open to mountain biking, hiking and horseback riding and there are Class IV and V rapids on the nearby Cheoah River. This little-known part of Western North Carolina is beautiful and rarely crowded. If you go, make sure to check out the stand of old growth poplar in nearby Joyce Kilmer Memorial Forest . 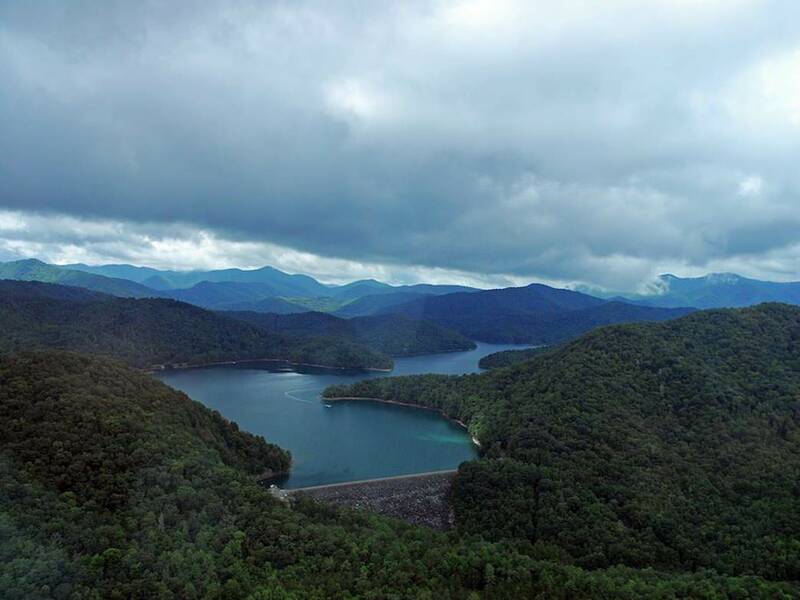 Fontana Lake was created with the completion of the Fontana Dam in 1944. It’s located just outside of Bryson City, about 1 hour 45 minutes from Asheville. It’s a little more developed than Lake Santeelah and it’s much bigger (11,700 acres). One of the lake’s claims to fame is its great smallmouth bass fishing, (not to mention that scenes from The Fugitive were filmed here) but because 90 percent of the lake is undeveloped, canoers and kayakers can find places to get away here, too. There are a few private campgrounds on the lake and the Tsali campground at the Tsali Recreation Area , one of the South’s premier mountain biking destinations. Fontana Lake has some of the best views of the mountains in the adjacent Great Smoky Mountains National Park, which can be accessed via the Appalachian Trail. The nearby town of Bryson City has some good restaurants and you can get the gear you need at the [Nantahala Outdoor Center’s](http:/noc.com) Outfitter’s Store in town. Lake Lure is the closest big lake to Asheville at 45 minutes away. Its public beach is often crowded at this time of year, so it’s not for those looking for quiet time on the lake. The upside of the development is that there’s everything from canoeing, kayaking and standup paddling on the water, to road biking, hiking, horseback riding and rock climbing off the lake. 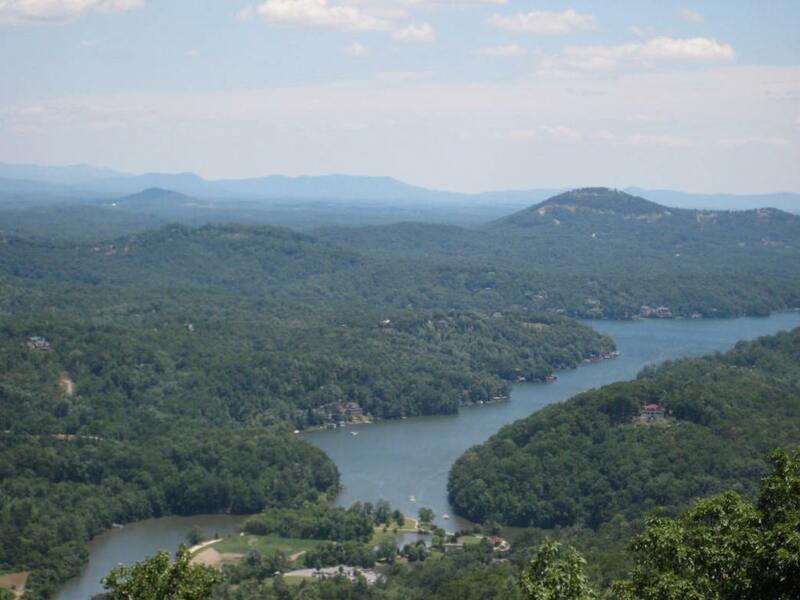 The campgrounds close to Lake Lure are private and generally open to both tent and RV camping. There are a number of restaurants, bars, resorts, and rental houses around the lake, and Chimney Rock State Park is just a few minutes up the road. Lake Lure has beautiful views of Hickory Nut Gorge and when you get away from the crowds, the scenery makes the effort worth it. Although it’s across the border in South Carolina, Lake Jocassee is only about an hour and a half from Asheville. It’s known for its beautiful clear water that takes on a bright green tint near certain parts of the lake. 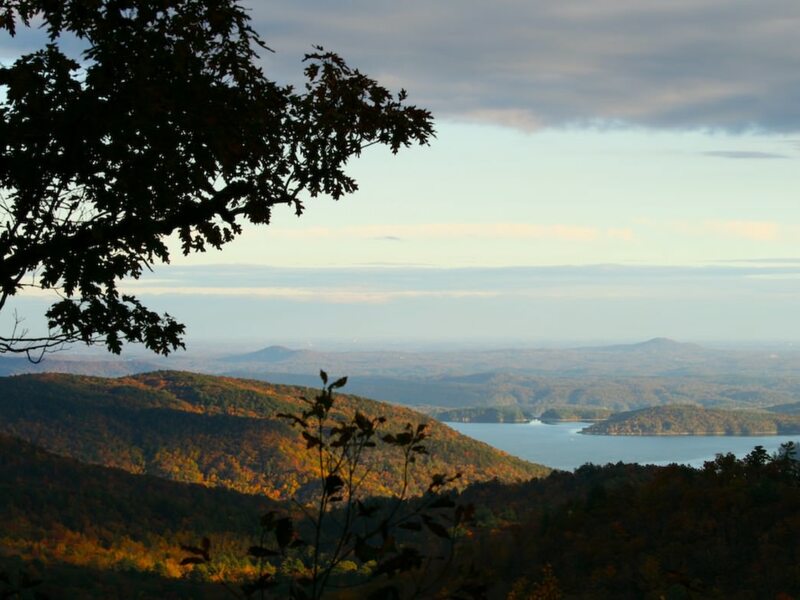 Because of its size (7,500 acres), much of Lake Jocassee is accessible only from the water and those areas include a number of waterfalls that are popular destinations for canoes and kayakers. 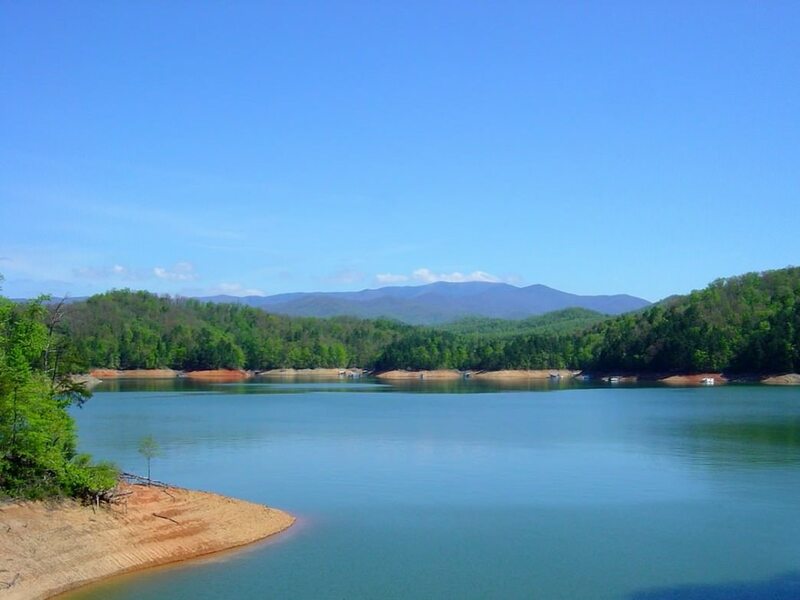 Lake Jocassee is accessible to the public through Devil’s Fork State Park, where there is a beach, boat launch, two camping areas and ‘villas’- which are furnished cabins adjacent to the water. While the beach and campgrounds can get busy in the summer, the crowds are surprisingly sparse once you’re out on the water (the lake is open to powerboats, though, so don’t expect to be completely alone).